Haiti is beautiful island in the Caribbean Ocean. But it is not an easy place to live. I Came from the Water follows the hardships of 8-year-old Moses, who lost his family as a baby when a small river next to his home flooded. Moses’ own life was saved thanks to a basket that floated him to the safety of a children’s village. The children’s village is an orphanage that provides shelter, care, and schooling for the multitude of children in Haiti who have lost their parents. And though day to day life is good for Moses, he continues to live through upheaval as Haiti gets hit by an earthquake, more strong rains and a Cholera outbreak. This book takes an unflinching look at life in Haiti, including the reality that some kids in the children’s village go to Heaven. But the overall message of I Came From The Water is one of survival. Moses is strong. He helps aid workers rebuild Haiti and takes care of the other children in the village. When he grows up, Moses wants to continue helping people by driving a tap-tap – a type of bus. The beautiful, bright pictures that accompany the simple text support the positive message of Moses’ story. As do the quotes by Father Rick Frechette, who runs a pediatric hospital, orphanage and other schools in Haiti, and Sister Judy Dohner, who knew Moses personally. The last two pages provide extra information about the author’s relationship with Moses, Haiti, and the Gonaives flood of 2004. Photographs highlight the destruction caused by recent floods and earthquakes, show the beauty of everyday life in Haiti, and introduce readers to people who are there to help. 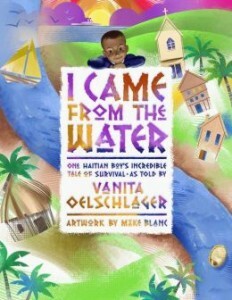 I Came From the Water should be on the reading list of every second grade student. Learning about Haiti through the eyes of Moses is both humbling and encouraging, and gives teachers an opportunity to introduce students to the lives of children beyond their own borders.